So the fishing in Alaska this year (or at least when I went) was absolutely TERRIBLE. I had always heard about these amazing fishing trips, so I was sorely disappointed. I had two day trips for fishing planned. 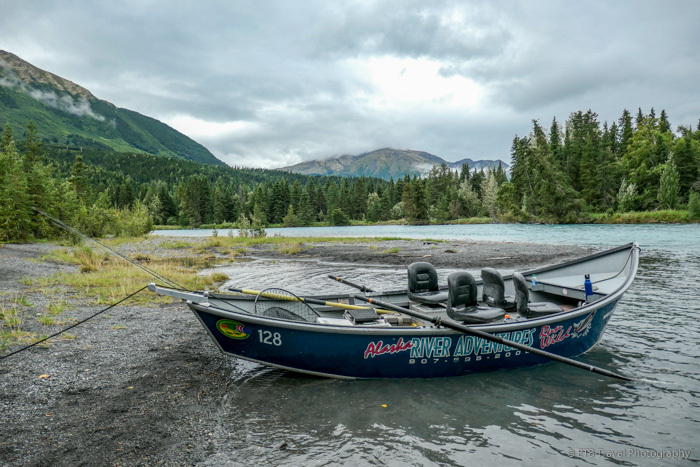 One for silver salmon on the Middle Kenai River and another for halibut fishing in Homer. Ross and I showed up at Alaska River Adventures in Cooper Landing by 8am for a day trip on the middle Kenai. Dressed in several layers to stay warm in the 45 degree weather beneath overcast skies, we pulled on our waders and headed to the boat with our guide Zach and two others who joined our trip. Zach rowed us a few miles down the river to our first stop where we unloaded, stood in the 40 degree water, and began our fishing with both fly rods and spinners. While there were some sockeyes surfacing, after about an hour without a bite, we moved around the corner where we had only slightly more luck as Zach hooked one silver salmon that made it into the net. A few of us foul hooked a couple other fish, but they promptly got free. Here is where I learned that the salmon are not biting as they swim up river to spawn, and they don’t eat while spawning. So we were supposed to cast into the school of fish enough times to irritate them in hopes of them hitting the “bait” or to try to foul hook them. What kind of fishing is that?!? On top of it all, I found out we were in the upper Kenai, not the middle Kenai! WHAT?!? I specifically asked when I made the reservation to go to the middle where there is a larger concentration of salmon. It turns out it was too windy and thus unsafe to go across the lake to the middle Kenai. I believe this should have been disclosed to me prior to taking me four miles down the upper Kenai River. I should have been given an option to not fish or to fish for trout which seemed to be much better. Instead, they took my money knowing the chances of catching the salmon were low. As such, I would not recommend the outfitter Alaska River Adventures. Anyway, we kept floating down the river and attempted fishing. We mostly casted into active sockeye schools (past sockeye season) and foul hooked a few more fish. A total of two other fish made it into the net. Around a total of ten hooked, three in the net, only one silver salmon for eight hours of fishing with five people under overcast skies which is supposed to be good. TERRIBLE! At least we saw lots of bald eagles, and some forget-me-nots, the Alaskan State Flower. I had read they get 4 inches tall and couldn’t believe it until I saw them! I booked a halibut combo trip with Captain B’s in Homer months ago as well. Unfortunately, the weather didn’t cooperate. The winds were too high, and it was unsafe to go out on the water. Captain B’s refunded my money. As such, Id recommend this outfitter. That is what Alaska River Adventures should have done. The unfortunate part about fishing in Alaska, is it is necessary to book the trip months in advance, thus the weather prediction is unknown. In fact, Captain B’s told me it is best to book fishing for two to three days. The problem with this is you really need to like fishing as that gets expensive in a hurry and takes time away from other activities. In addition, customers are not refunded if they cancel. It’s a one way street, only outfitters may cancel on customers. Damn! Sounds like a frustrating outing. I hope the tripn had some redeeming value somewhere along the line. The Baer watching was spectacular. Haven’t posted on it yet. I was fishing for silver, but they took us to the upper kenai, not the middle where the fish congregate. Was not happy with the outfitter as they didn’t inform me of the change until after I was on the river.